Kansas City, MO. Sept. 5, 2018– Napoleon: Power and Splendor marks the first examination of the majesty and the artistic, political and ideological significance of Napoleon’s imperial court, from Napoleon’s coronation in 1804 to his final exile in 1815. The exhibition opens at The Nelson-Atkins Museum of Art in Kansas City Oct. 26 and aims to capture the spirit that prevailed in the French imperial court and to recreate the sumptuous ambiance of Napoleon’s reign. Dr. Kathryn Galitz from the Metropolitan Museum of Art discusses how Gérard’s ascent as a portraitist coincided with Napoleon’s rise to power at the end of the eighteenth century. As Emperor, Napoleon exploited the propagandistic power of art, and Gérard’s portraits of Napoleon and his family shaped Napoleon’s imperial image. Exhibition ticket required. Meet in Gallery L15. University students from the honors college at University of Missouri-Kansas City will be stationed throughout the exhibition to discuss connections between the artworks you see on display and French literature selections. Your not-so-quiet night at the museum! Honoring the spirit of Napoleon and 1800 France, November’s Third Thursday includes exhibition-related activities, performances, and more. In 1800 France, the “six degrees of separation” game might well have been played surrounding the opera singer, Giuseppina Grassini. Lover to both Napoleon and his nemesis, the Duke of Wellington, this star of the operatic stage was also the aunt of two operatic superstars, the Grisi sisters, and is part of a lineage that extends to Maria Callas and beyond. We’ll connect the past to the present via vocal excerpts performed by the Lyric Opera of Kansas City Resident Artists, and view portraits of the major players that helped shape Operatic and Napoleonic worlds. While Napoleon was famed for his military prowess, he was an ardent admirer of music, from oldies to popular songs to his contemporary composers like Giovanni Paisiello and Niccolò Antonio Zingarelli. Ridley Scott’s directorial debut tells the tale of two French officers engaged in 16 years’ worth of grudges and duels, set against the backdrop of the Napoleonic era. Based on the Joseph Conrad short story The Duel, which in turn was based off two real French officers in Napoleon’s Army, The Duellists was celebrated for its historical accuracy regarding the Napoleonic uniforms, military conduct, and early-19th-century fencing techniques. Immerse yourself in a rivalry for the ages. 1977 | PG | 100 min. Based on the novel of the same name by Annemarie Selinko, this film tracks the evolution of Désirée and Napoleon’s relationship, from his rise through the military ranks, their separation as they go on to marry others, and their paths crossing once again towards the end of reign. 1954 | NR | 110 min. Napoleon: Power and Splendor is organized, produced and circulated by The Montreal Museum of Fine Arts with the participation of Château de Fontainebleau and the exceptional support of Mobilier national de France, in collaboration with The Nelson-Atkins Museum of Art. In Kansas City the exhibition is supported by Adelaide Ward; Shirley Bush Helzberg; G. Kenneth and Ann Baum; Linda Woodsmall DeBruce and Paul DeBruce; Karbank Holdings LLC; John and Marny Sherman; Arvin Gottlieb Charitable Foundation; The Bergman Family: Brad and Libby, Bart and Joanie; Marion and Henry Bloch Family Foundation; Muriel McBrien Kauffman Foundation; Barton P. & Mary D. Cohen Charitable Trust; Nancy and Rick Green; R.C. Kemper, Jr. Charitable Trust, UMB Bank, n.a., Trustee; Sara and Bill Morgan; Thomas and Sally Wood Foundation; Linda Lighton and Lynn Adkins, Dr. Steven St. Peter and François Bardonnet; The Robert and Dr. Phyllis Bernstein Family Foundation; Barbara and Peter Gattermeir; Peter G. Goulet; Hartley Family Foundation; JE Dunn Construction; Ford and Christine Mauer; Karen L. Christiansen; McCownGordon Construction; R. Lyman and Sally Ott; and Bill and Marilyn Taylor. Image captions: Andrea Appiani, Italian (1754‐1817). 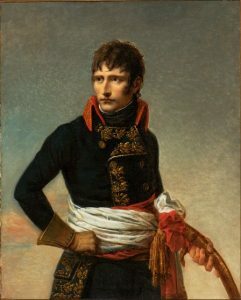 Portrait of Napoleon Bonaparte, First Consul, in the Uniform of a General in the Army of Italy, 1801. Oil on canvas, 39 x 31 4/5 inches. Montreal, private collection. Photo MMFA, Christine Guest. Pierre‐Antoine Bellangé, French (1757‐1827). 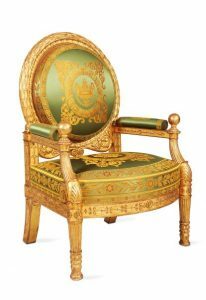 Presentation armchair for the Grand Salon of the King of Rome’s apartment at the Tuileries, intended for the Emperor and Empress, ca. 1804–1815. Gilded wood, silk, 45 3/10 x 32 3/10 x 26 inches. Paris, Mobilier national, GMT 1228. Photo collection du Mobilier national © Isabelle Bideau. François‐Pascal‐Simon Gérard, French (1770‐1837). Portrait of Napoleon, Emperor of the French, in Ceremonial Robes, 1805. Oil on canvas, 94 1/2 x 61 inches. Château de Fontainebleau‐Musée Napoléon Ier, N16. Photo © RMN‐Grand Palais / Art Resource, NY / Gérard Blot.